I'm creating a list of all major problems we are experiencing and request that Fizz address these ASAP and give us a ETA for fixing these issues. PLEASE LOVE THIS QUESTION TO SHOW FIZZ ITS IMPORTANCE! We deserve to be in the loop and be updated! You forgot only 3G data, not the advertised LTE since Saturday am. Friday's special 5 hours outage. Data Roaming to US is poor. Maybe you or Emre should list the issues in the form of a poll? People can vote for what is their most urgent issue. Fizz can than allocate all their resources to it. All their resources being that one guy lol. I second the 3G only (no LTE) for the last day or two. And..., the 3G will 'disconnect' (no data at all) for periods. Are 95% likely to be the same problem. Messages from companies are called A2P (Application to Person) and the business is run by aggregators. I suspect aggregator links are coming online little by little. (Ex-aggregator commerical manager's input). Fizz don't do VoLTE so this is not really a problem. For the other's, fill your boots they appear to be real problems. I'm not sure you'll get an ETA however, much and all as you'd like one! How about a properly staffed, properly trained and dedicated Fizz support team? God. . I haven't been able to receive texts for 15 days. 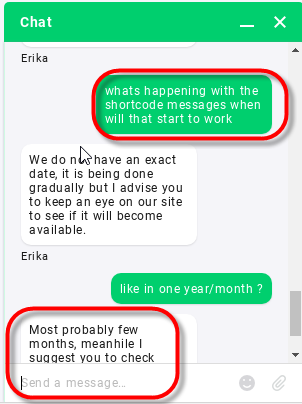 I remember that it's mentioned on the website somewhere that automated texts from large companies might not work. I don't think that was hidden. Their infrastructure is surely growing. As for calls on Fizz Ext, is your APN properly configured on android/IOS updated on iPhone? I always get a message saying "Fizz conditional call forwarding enabled" when I make outgoing calls. Not sure if that's what you mean. I'm not sure what it means myself. When someone is sending you a loong sms you receive it in multiples parts not in order..
Security option in the voicemail makes no difference if enabled or disabled. Voicemail not taking messages on the EXT network. It says we're calling from an unknow number and ask for a phone number..
Voicemail not taking messages on the EXT network if the phone is not answered. It says "Welcome to YOUR Fizz voicemail" and then "you're calling from an unknown number" and ask for a phone number..
you're unhappy, I've made a special note on your ticket for our specialized team"
I got an email saying they'd even extend my beta plan price except that have failed to find any solution to restore my service. I've updated payment method 4 times. Reset my phone. Still they do nothing. The fact itself that the service status (https://fizz.ca/en/faq/status-services) continue to say only that "Our services are all fully functional". That's cute! ;) Instead of solved issues, we get "promotions" now. I just passed from Apprentice 3/5 straight to Geek 1/5. Wooow !!! Fizz, you made my day! I joined Fizz for about 2 weeks but I've already had 2 major outages. On top of that, I couldn't find the chat bubble to talk to a customer service rep. What is going on Fizz? ?